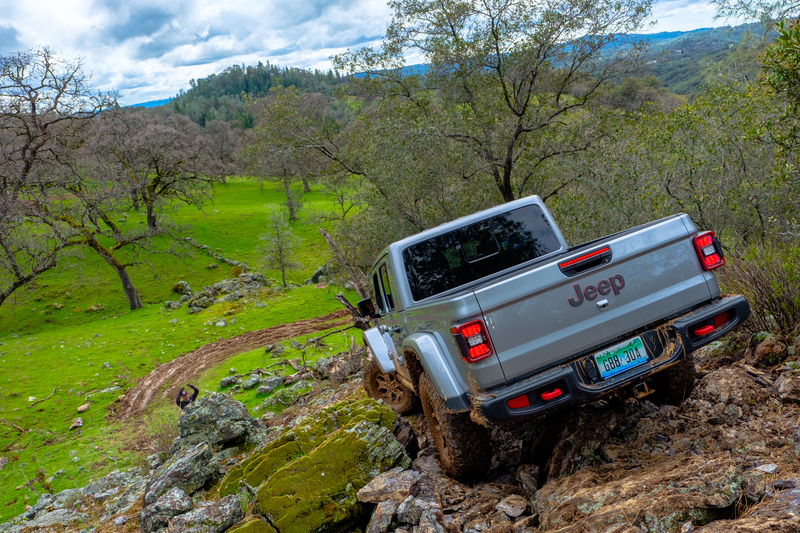 Since the official unveiling of the Gladiator last November, we have been discussing comparisons, weighing opinions, and feverishly waiting to get behind the wheel of the latest Jeep truck to see how it would stack up against the Colorado, Ranger, Tacoma, and Frontier. 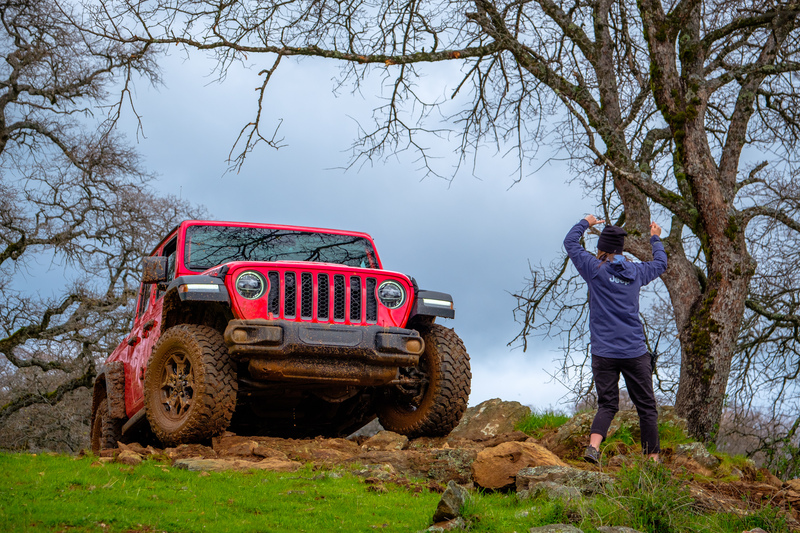 That opportunity finally arrived earlier this week when we set out on a rainy Northern California day to put it through its paces on bumpy highways, winding back roads, rocky trails, and muddy two tracks. In many ways, these tests confirmed our hopes that this was the ultra-capable mid-size truck we’ve been dreaming of, yet it also revealed some shortcomings we hadn’t expected, and that leaves room to question whether or not it will be crowned king of the segment. 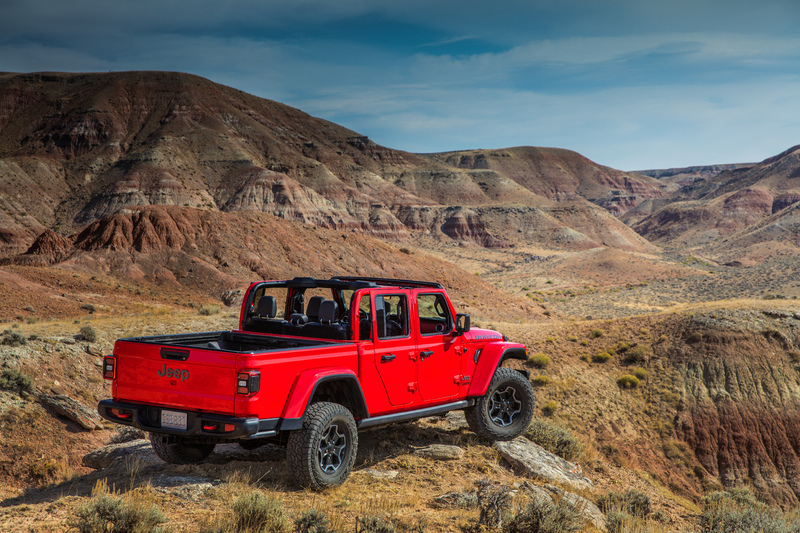 Jeep may have named this truck Gladiator to pay homage to its forebears, but it’s going to earn the title in a fight for the mid-size market. 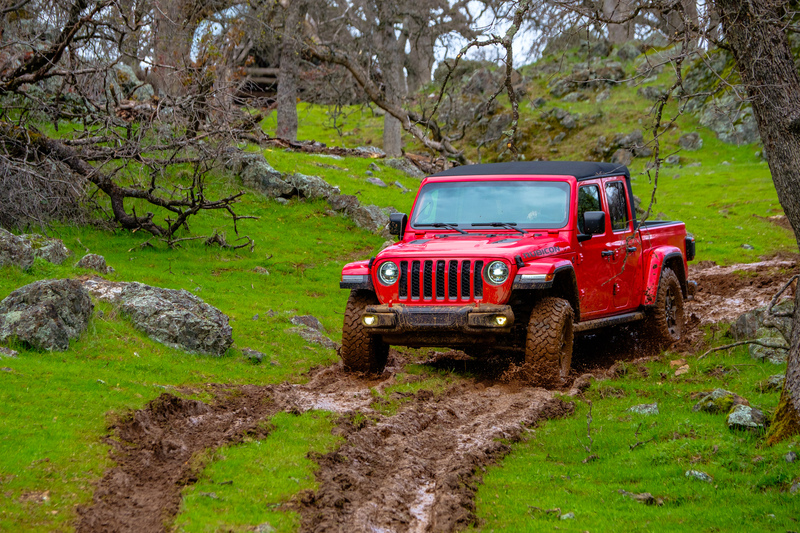 The Jeep Gladiator is a magnificent mid-size truck with loads of character and unique features that we love. 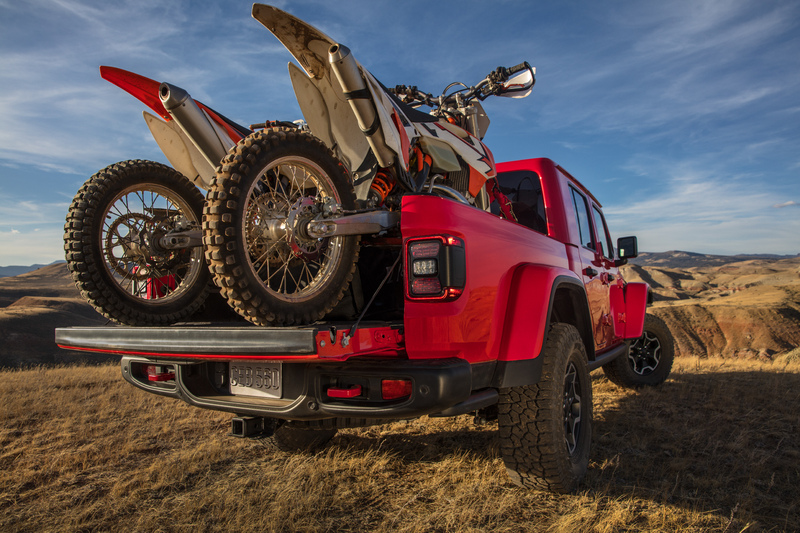 It holds true to the brand’s claim of being 100 percent truck with class-leading payload and towing capacity, while also being 100 percent Jeep thanks to unmatched capability in technical terrain. 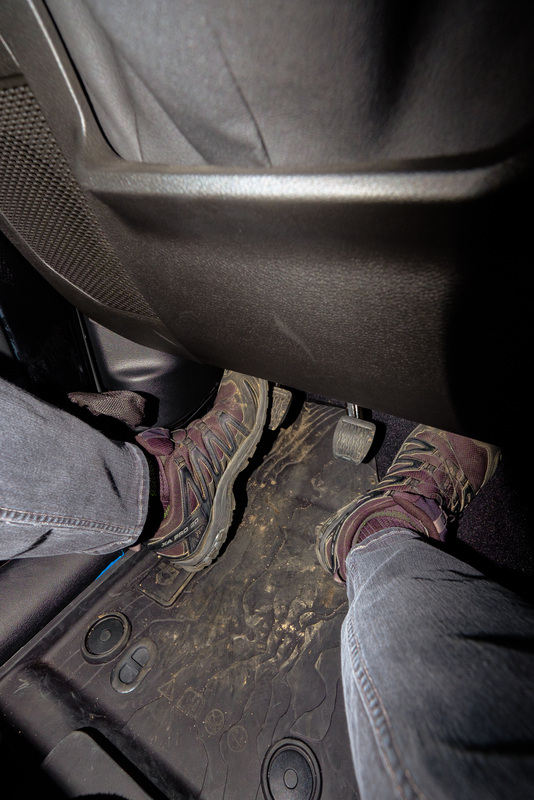 When it comes to daily driving and cruising down bumpy dirt roads, there’s still some room for improvement. So first things first. We know everyone has been waiting to find out how much it will cost and what the fuel economy will be, so let’s knock that out. 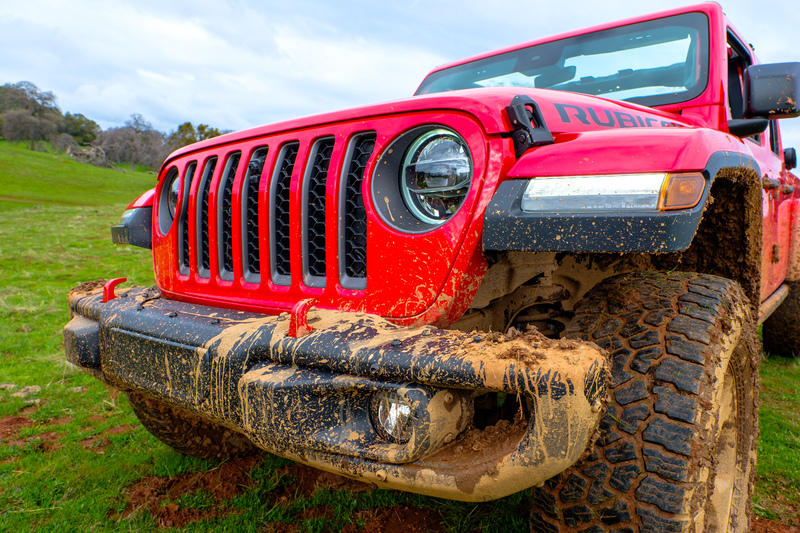 Despite all of our initial guesses, the base suggested retail price for the Gladiator is quite affordable, a mere $2,100 over the standard four-door JL. The various trims are priced as follows but will include an additional $1,495 USD destination fee. The astute reader might be thinking, wait a minute, $43,545 for the off-road model isn’t affordable. That’s more expensive than the ZR2, TRD Pro, FX4, or Pro-4X, and you’d be right. We’ve provided a handy little reference sheet below. Here’s the thing though, comparing the Gladiator Rubicon to any of these trucks isn’t really fair. It has more armor, more features, more payload and more towing capacity than any of its competition. In truth, the only direct competitor is really the ZR2 Bison, which clocks in at over $48,000, albeit with leather and a range of niceties not included on the base Rubicon. 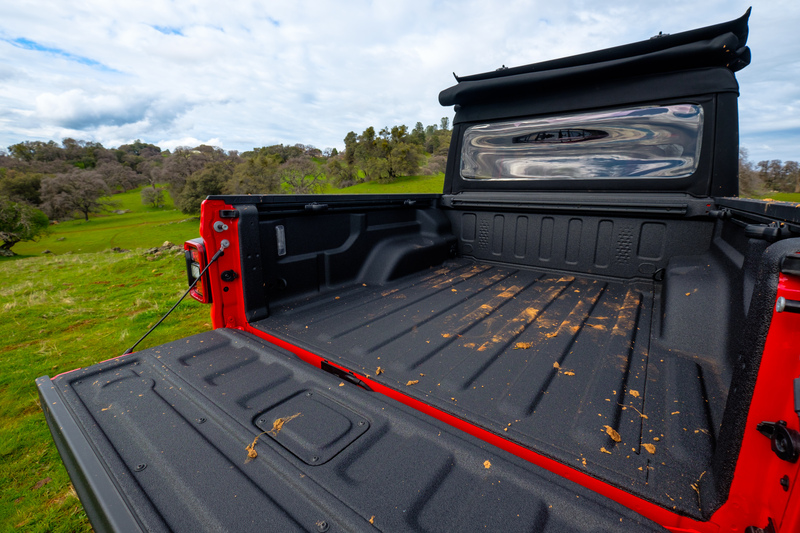 If you’re comparing apples to apples, the TRD Pro, Ranger, and Frontier are closer to the Gladiator Sport or Overland packages in terms of capability and protection, and that gives a whole different perspective on this truck’s pricing. 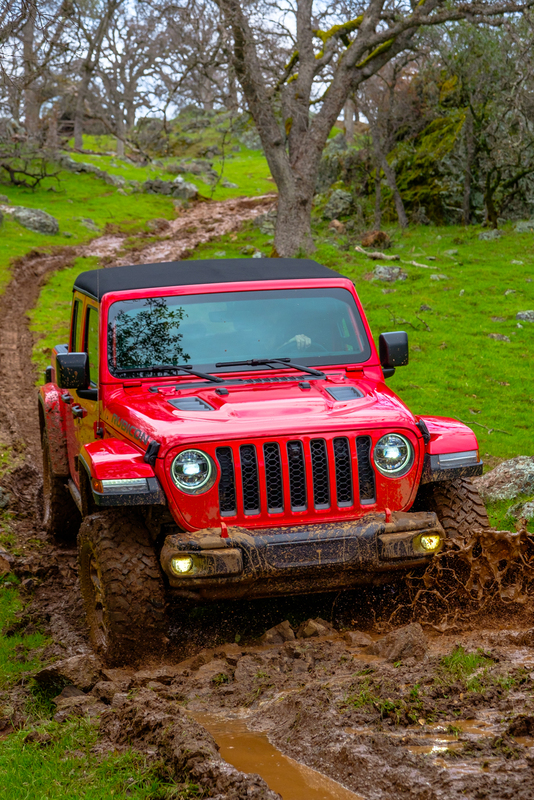 Let’s be honest, if anything related to a Wrangler wasn’t overwhelmingly capable on the trail we would be pretty disappointed, especially if part of that vehicle’s marketing campaign claimed it was 100 percent Jeep. 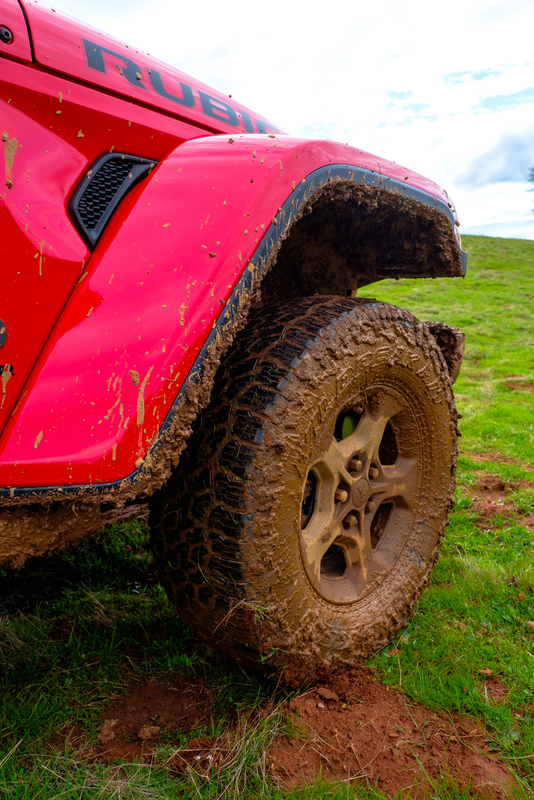 Fortunately, the Rubicons in which we completed the off-road course did not disappoint. Let’s just look at some of the specs. 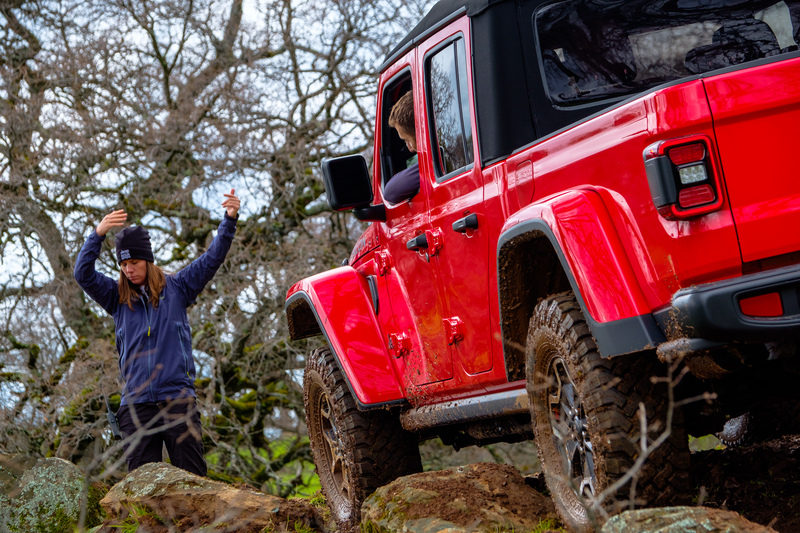 The Gladiator Rubicon boasts a massive 43.4-degree approach angle, 20.3-degree breakover angle, and a 26-degree departure angle with 11.1 inches of ground clearance at the lowest point. Those are better numbers than you’ll find in any other mid-size truck available, with the exception of breakover angle, as competitors are offered in access cab variants with a shorter wheel-base. The Gladiator also has the largest tires ever fitted to a Wrangler, 33-inch Falken A/Ts or M/Ts. Those sit beneath fenders placed 2 inches higher than on their Sport or Overland models. Why? 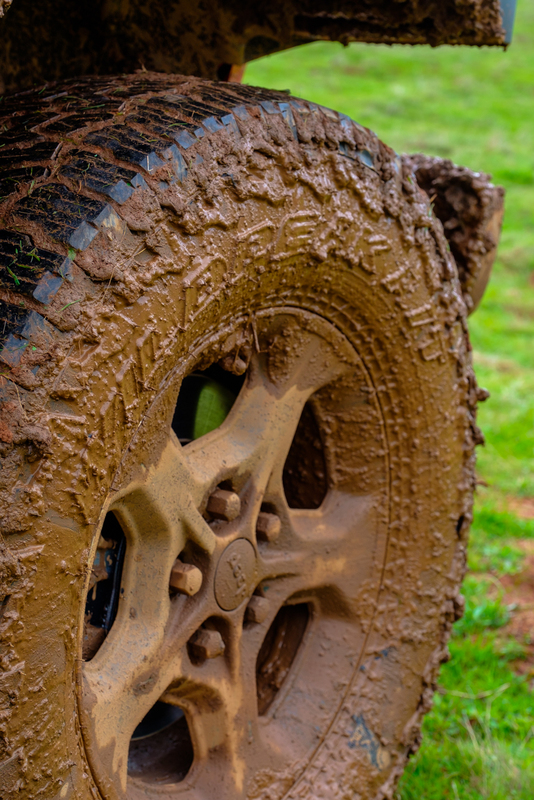 So you can accommodate up to 35-inch tires without any lift. There’s even a matching spot for a 35-inch spare underneath the bed. If you opt for a 6-speed manual transmission, the Gladiator will deliver a crawl-ratio of 84.2:1, or 77.2:1 with the automatic gearbox instead. Both make impressive use of the engine’s 260 pound-feet of torque, giving the Gladiator the ability to crawl over just about anything in front of it. 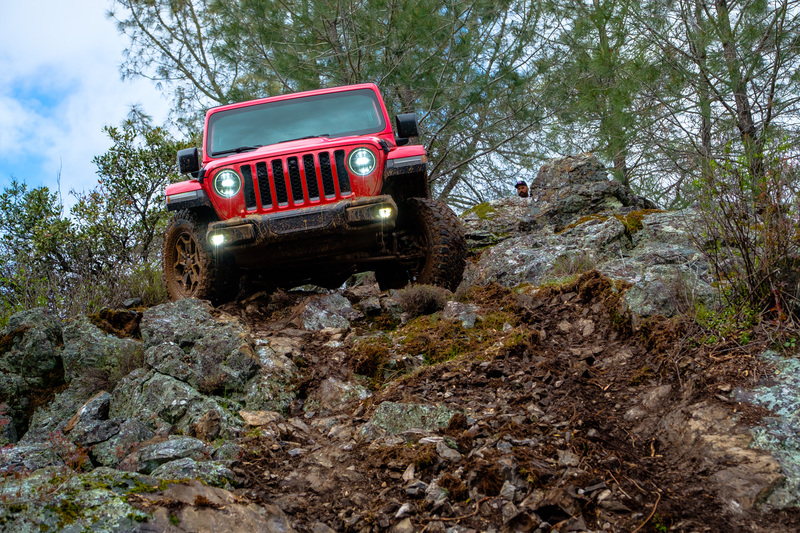 Like the JL, the Gladiator features Jeep’s Rock-Trac four-wheel-drive system, which uses a 4:1 gear ratio, Tru-Lok electronic locking differentials, and Dana 44 solid front and rear axles. A winch-ready steel bumper adorns the prow, skid plates armor the bottom protecting vital driveline components and fluid reservoirs, and sliders line the rocker panels all the way to the stub rails protecting the ends of the bed. 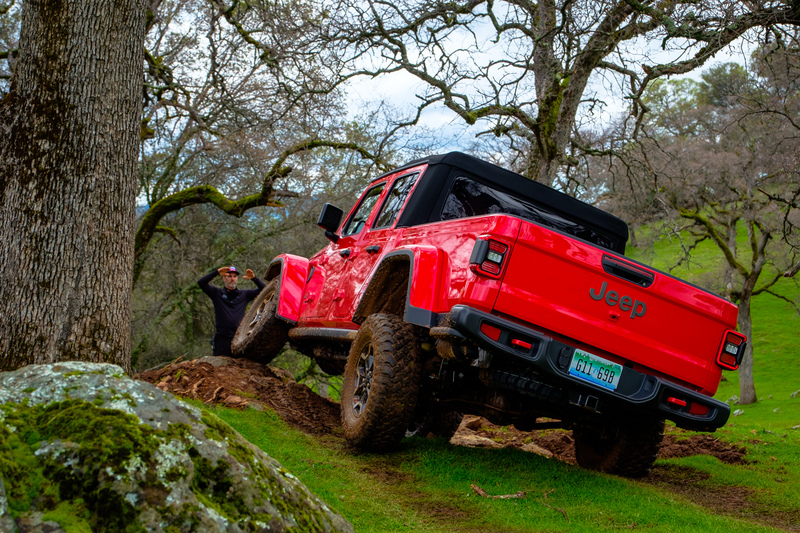 In traditional Wrangler fashion, the coil-sprung suspension has loads of articulation, and the sway bar can be electronically disconnected to give it even more. Add all of this up and there is simply no way around it, the Gladiator is the most capable mid-size truck available for tackling technical terrain, period. A fact which is proved handily on the off-road course. 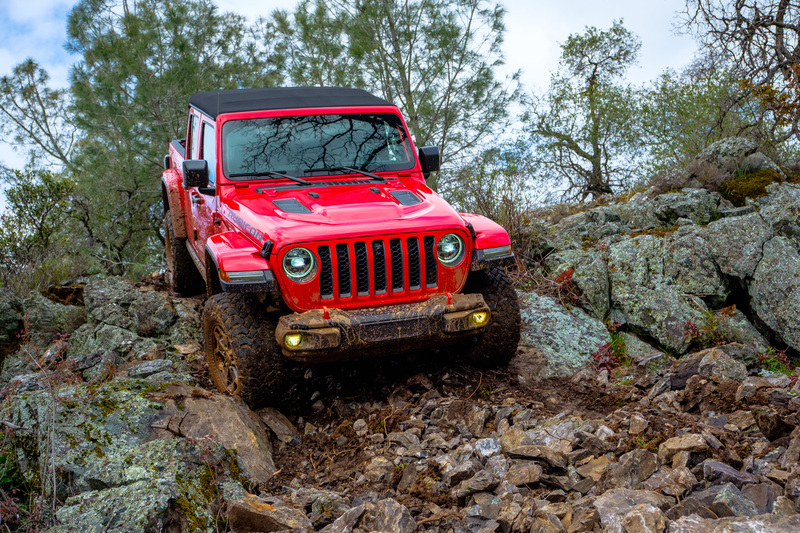 During our tests the Rubicon effortlessly glided through the rock gardens, flexing its way over each obstacle with massive articulation and effortless composure. It felt planted and predictable on loose surfaces, generally making difficult situations look, and more importantly feel, like a walk in the park. With the front and rear differentials locked the thing was unstoppable, only occasionally finding its limits on breakover angle or total clearance. Not that it really mattered though, as the sliders and skid plates would protect the truck while it slipped over the crux of each obstacle and proceeded onward without missing a beat. 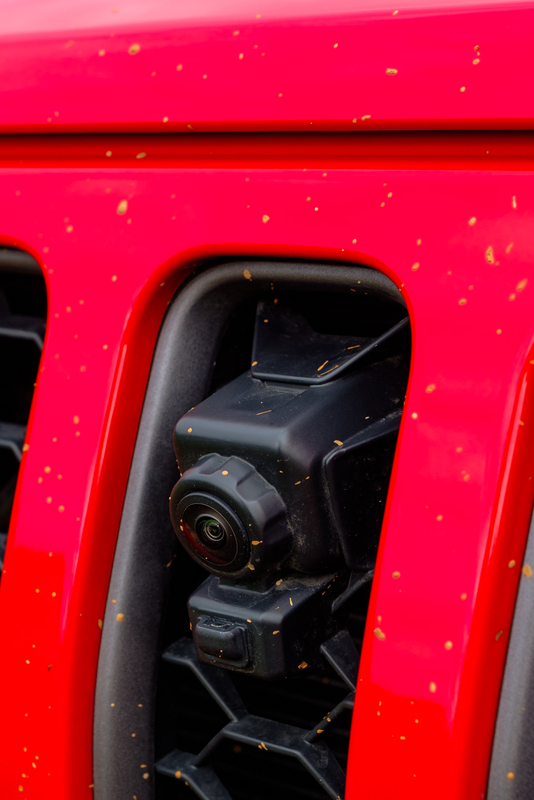 As you’d expect from a Wrangler platform, the trail visibility was excellent, but if it became blocked by the hood on steep ascents or sharp corners we were able to use the trail camera to self-spot. It features dynamic grid lines to display your path forward as you turn the wheels, and even has an integrated spray nozzle to blast off mud and dust. In 4-high we had the chance to tackle slippery two tracks and several mud pits, which the Gladiator devoured eagerly. Never did we feel as if it were losing traction or even slowing down. The M/Ts simply bit and cleared with each rotation while the truck’s traction control system kept it moving down the trail. When conditions became really slick we clicked the Off-Road Plus button, which enables the rear differential to lock at higher speeds. Despite its admittedly flawless performance on technical terrain, I wasn’t quite as impressed on bumpy or corrugated dirt roads. 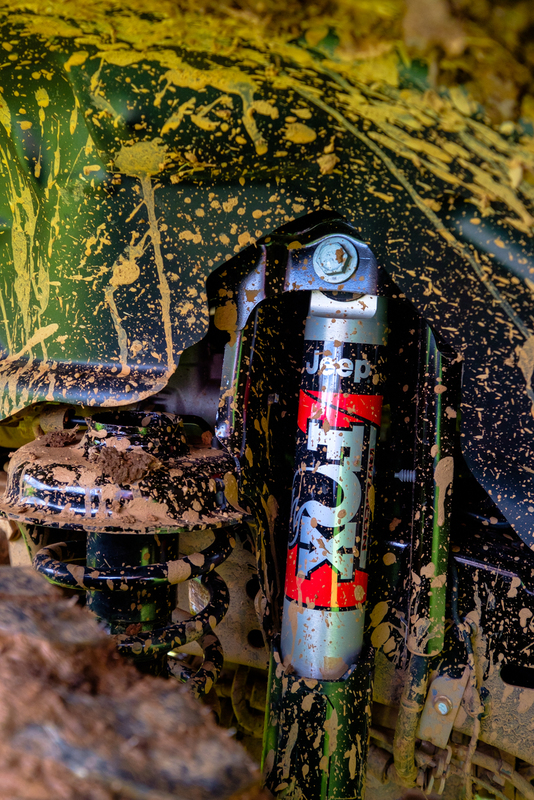 The Gladiator felt comfortable overall, on par with trucks like the Tacoma and Ranger, but its 2-inch mono-tube Fox shocks definitely fell short of the Colorado’s Multimatic system. I should point out that this is less of a mark against the Gladiator, and more of an acknowledgment that Chevrolet is simply miles ahead of everyone in the suspension game at the moment. By all means, the Gladiator suspension is still good on bumps, it’s just not great as we experienced pronounced head toss and a general sharpness to the impacts. The vehicle also wanted to step out the rear on corrugations. For tackling two tracks and forest roads, or doing high-speed off-road driving, we’d still take a ZR2. 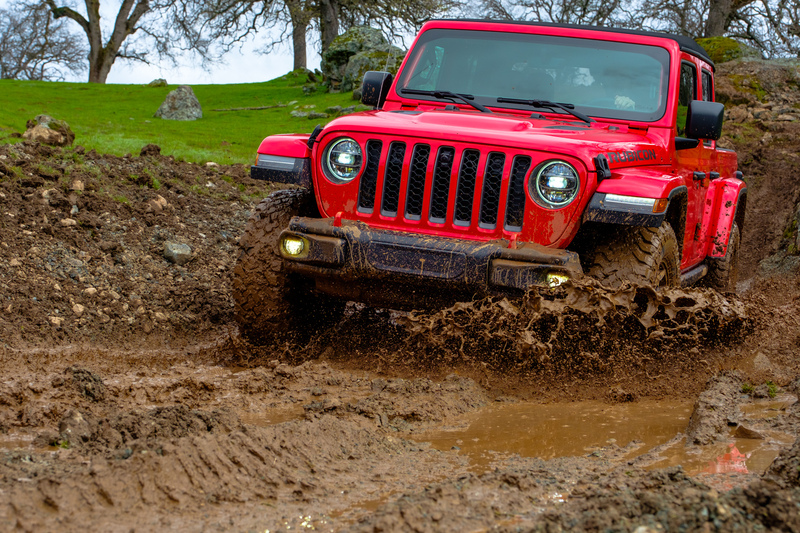 High speeds have never been Jeep’s forte, and that’s okay. They’re the kings of technical terrain, and we love that they play to their strengths with features that complement that. Take the selectable tire fill alert system for example. It allows you to set your desired air pressure and chirps the horn when you hit it airing down or airing up. It has removable carpets so you can hose out the interior, a fold-down windshield, and the famous removable top and doors. We won’t dive into the specifics of each configuration available, but we will say that a mid-size truck without doors or a roof just feels right, and we quickly fell in love. 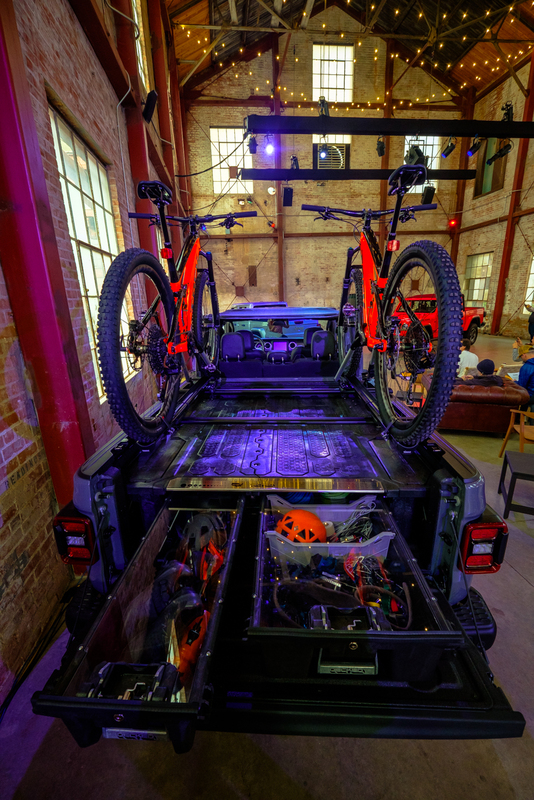 I will make a note on the convertible top though, which is designed to fold back without getting in the way of bikes or other gear in the bed—a smart idea really. The only downside is that it looks a bit goofy when you just plop it back on itself. We’d recommend removing it altogether, unless you enjoy people telling you that you forgot to put your roof away. 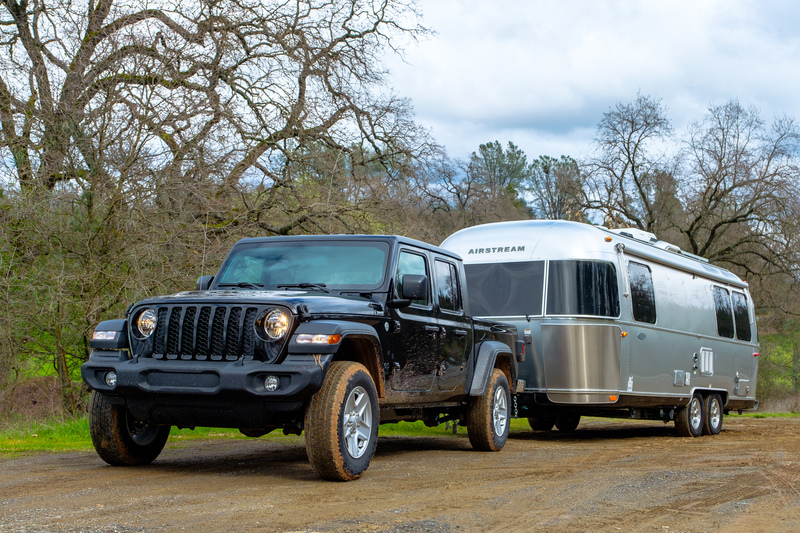 A large payload capacity, good road manners, and a high tow rating aren’t exactly what the Wrangler is known for, but the Gladiator is far from just a stretched out JL. 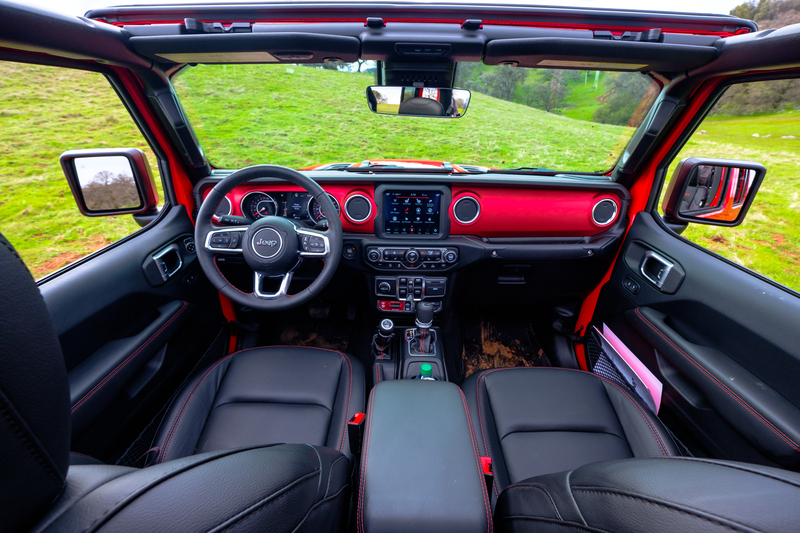 As Jeep will remind you, it’s 100 percent truck a well as 100 percent Jeep, and that means they pulled some black magic during the design phase which paid off in a big way. 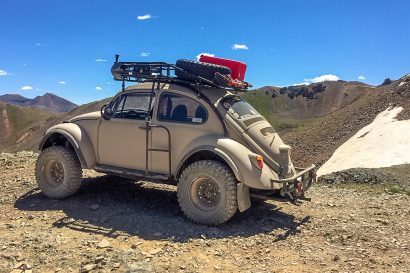 For starters, the engineers gave the Gladiator light-weight aluminum doors, hinges, hood, fenders, a windshield frame, and tailgate to save weight, while also equipping it with a high-strength steel frame for a best in class payload of 1,600 pounds. That is even better than a Tundra TRD Pro and over 400 pounds more than a Tacoma. That generous payload can be used to haul people, gear, and supplies while still providing capacity for a winch, bed rack and rooftop tent. 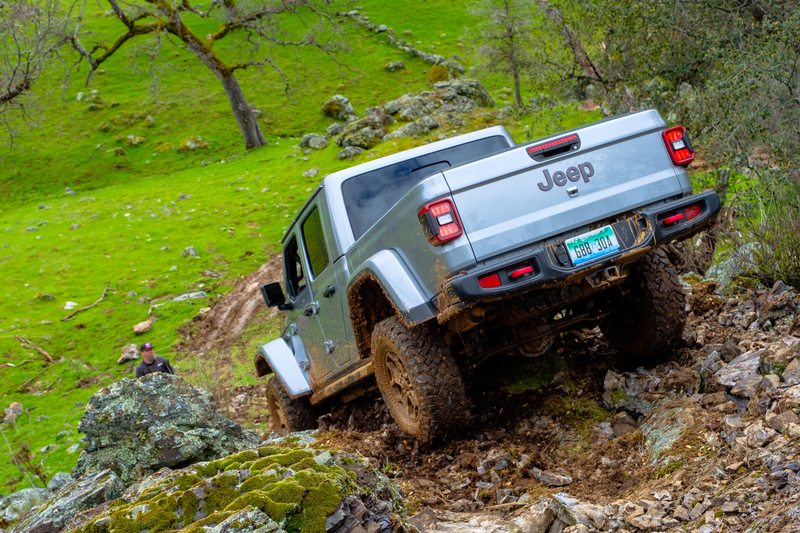 Thanks to a five-link suspension setup, integrated anti-sway control, larger vents in the grill, an additional electric fan, and the largest brakes in the segment, the Gladiator takes the crown in towing too, pulling off a rating of 7,650 pounds. Unfortunately, both the payload and tow rating decrease when equipped on a Rubicon due to “larger tires,” which I found strange given that those tires are equipped on a vehicle with lower gears ratios and heavier duty components. I’m no engineer though, so I won’t argue the point. In the Rubicon trim level, the Gladiator takes home a payload of 1,160 pounds with the automatic, or 1,200 with the manual. 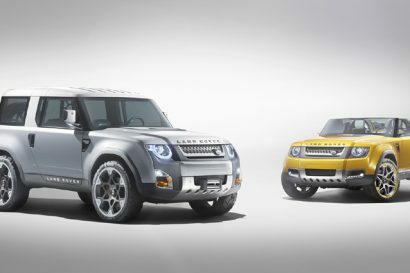 It still scores an impressive 7,000-pound towing capacity though, which is significantly higher than its off-road competition. For any serious towing, it will need additional tow mirrors to strap onto this truck before hitching up a trailer, as they are marginal for normal use, and downright inadequate for towing. And what about that 5-foot bed? Is it actually practical to use? Despite my initial shock of how shallow the Gladiator’s bed is, I have to say that I love its functionality. It’s built from high-strength steel and is easy to access from any side thanks to the low bed walls. It features integrated tie-down points throughout, which can be folded flush so that you can fit a stack of up to 19 sheets of plywood without rubbing against protruding D-rings. 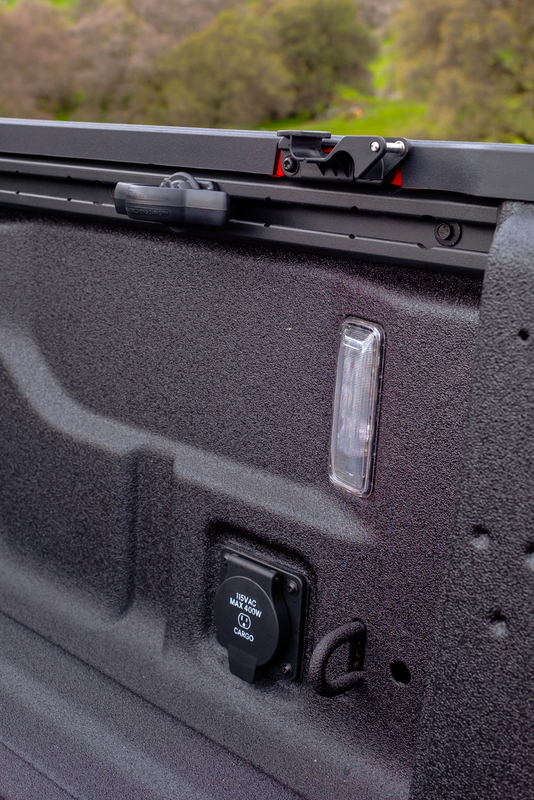 The damped tailgate is aluminum to save weight but rated to 1,800 pounds making it perfect for loading motorcycles or heavy supplies. Speaking of which, Jeep claims the bed will accommodate 95 percet of all motorcycles currently on the market despite the bed’s dimensions. You’ll also find integrated LED lights for securing cargo at night or locating small items in the dark, and a power port for running a fridge or charging devices. During the hour and a half or so we spent on the highway, I found the Gladiator to be surprisingly comfortable. The heated seats are soft yet supportive, the visibility is excellent, the sound system is crisp, and there are plenty of niceties like an 8.4-inch touchscreen and heated steering wheel to keep you happy on long drives. It feels like it has plenty of power to pass or accelerate, and the gearing is spot on for cruising with the Pentastar powertrain. The square profile does give it greater wind noise than we’d like though, and I wish it had a dead pedal to rest my left foot on. 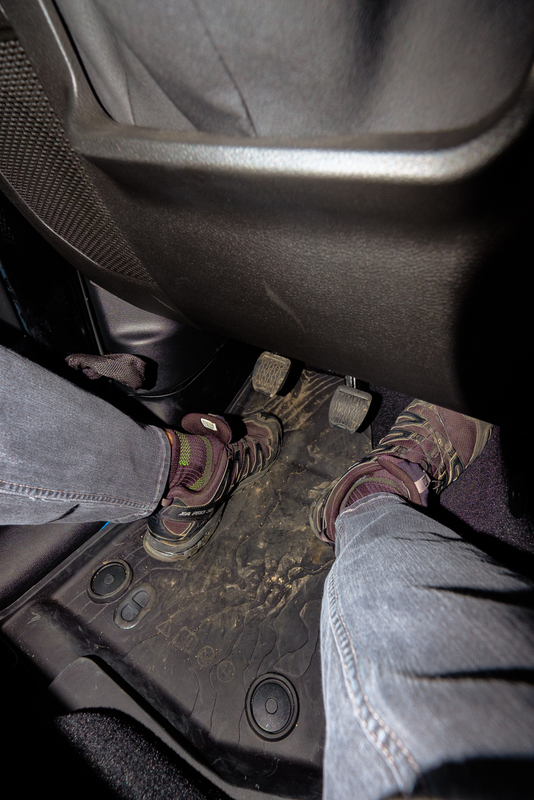 It should also be noted that on the manual, the clutch pedal is too close to the door to slide your foot around, so you must snake it back and then beneath the clutch pedal to be comfortable when cruising. This isn’t unheard of, but it can get a bit annoying on longer drives. On twisty backroads, I was impressed by the Gladiator’s ability to carve around corners. Yes, that’s right, a Jeep carving around corners. 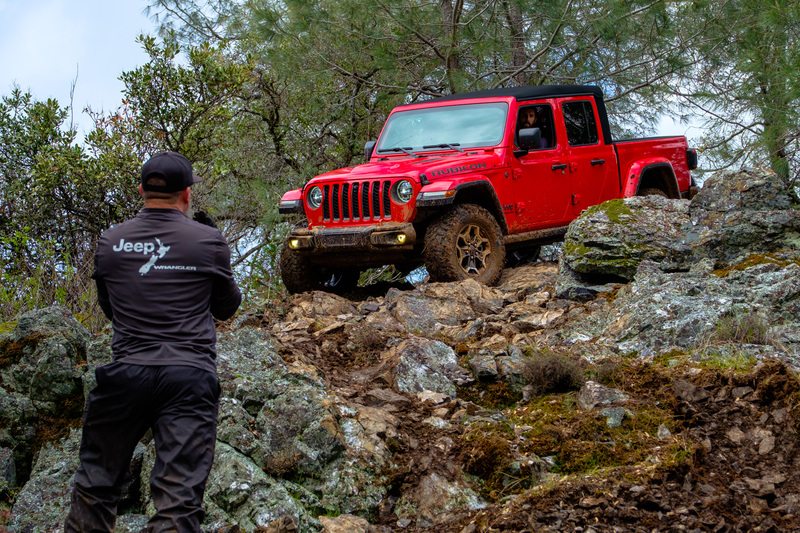 It didn’t feel like what I had expected from a Wrangler, that loose rolling ship sensation, but rather like a proper modern truck with flat and predictable handling. The 3.6L V-6 felt peppy through the 8-speed automatic transmission, but I was shocked to find that in the 6-speed it was somehow lethargic. The clutch throw was good, but the motor just didn’t come alive as it did with the automatic. For what might be the first time ever, I’d recommend avoiding the manual. For me, the Gladiator was a breath of fresh air injected into the mid-size market. It is attractive, easy to drive, and packed with utility that other off-road trucks struggle to match. 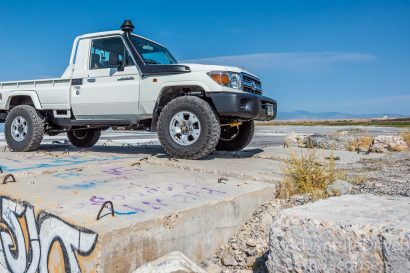 It has clearly staked its claim as a leader in the segment, and without a doubt seized the title of the most capable mid-size truck on technical terrain. We’re not sure if it can claim to be the ultimate mid-size truck, but it’s close—very, very close. We’re thinking a head- to-head test might be in order. Anyone else agree? 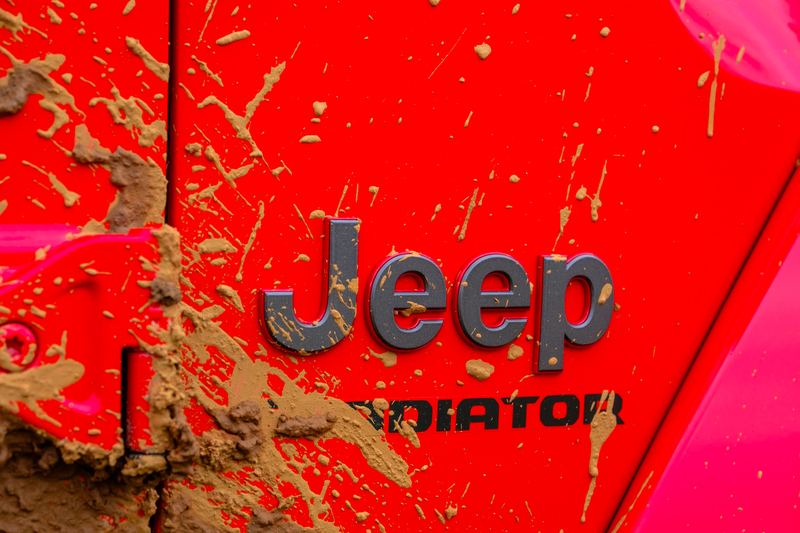 To learn more, visit Jeep’s website here.